This weekend we finished building our rain gardens! We began the design work and research for this project last August. While researching on how to create rain gardens, a lot of information we found online was very basic. We realized there would be some trial and error during this process because our site has a strong slope. There’s a little brain power needed before creating a rain garden. Some numbers are needed to really know how big a rain garden should be. It is an important step because in the end, you want to know if all your work is really going to pay off! To know how big a rain garden needs to be, we need to know how big the roof is. To know that, we need to figure out its slope. To find out the pitch of a roof, you need to know how much distance the roof rises for every horizontal foot it runs. Roofers have to know these equations to know how many square feet of shingles they’d need to roof a home. The guide below is for a basic roof and for you to get an idea. If you have a complex roof, with many angles and levels, I honestly couldn’t tell you how to do that. 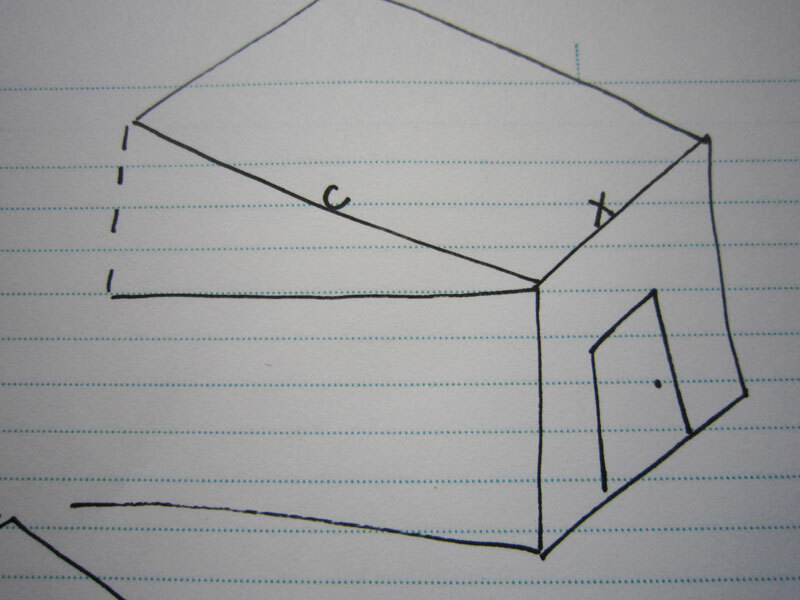 There are resources online how to calculate surface area of odd roofs. We’re going to have to take a trip back to middle school geometry in order to do this! Hang in there, I promise it’s not as hard as it seems. The area between a, b, c, makes a right triangle (with a 90 degree point between b & a). We’re going to use the Pythagorean Theorem to figure out the numbers for these distances. We’re doing all of this to find the length of letter C to ultimately find the surface area of the roof. Since we can’t fly, and renting scaffolding to measure it all out by hand would be silly, we can just measure a tiny section of the roof, right where the two points of the roof and the gutter/flashing meet. All you need is a measuring tape and a ladder. 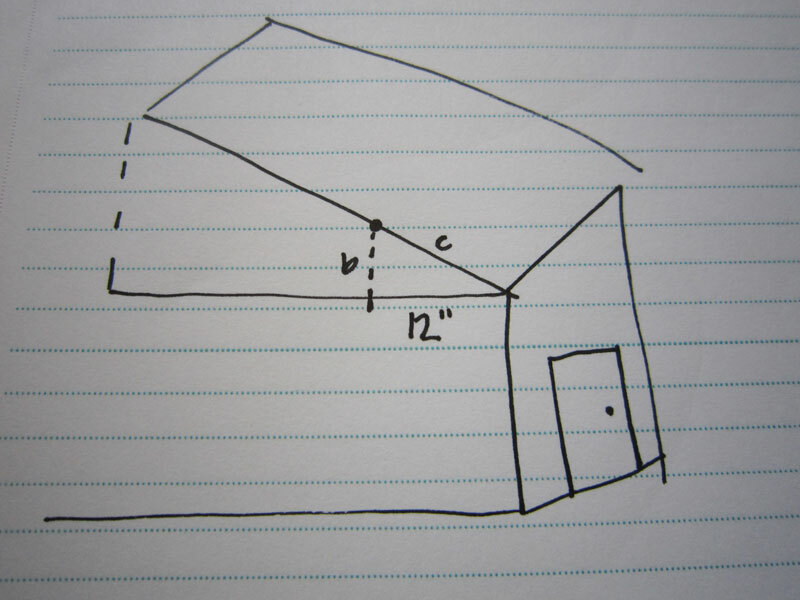 First measure 12″ across on your roof line as shown in the diagram. Then measure the number of inches for height b. This all will calculate the slope (rise/run) or pitch of the roof. 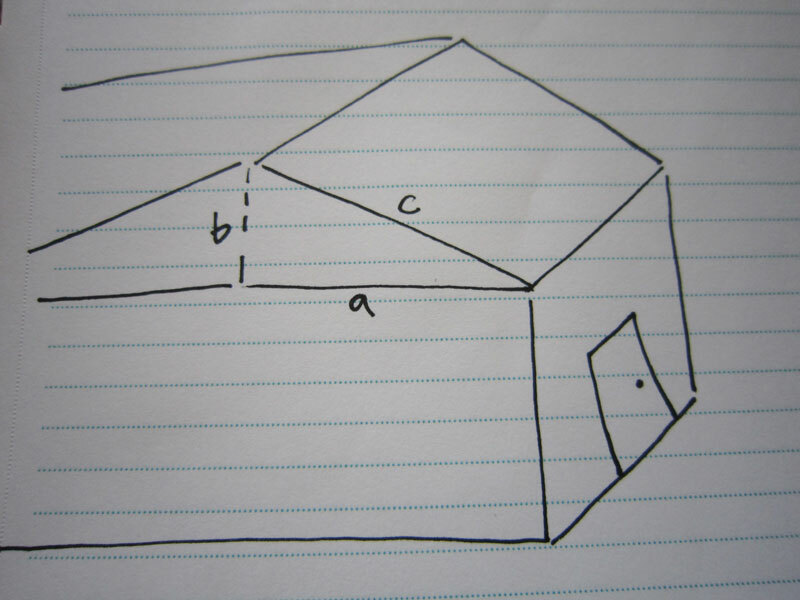 For my roof, a=12″, b=9″, c=?”. This means for every 12″ of horizontal distance, my roof raised up 9″. So now we know for every 12″ of horizontal distance, the roof has a distance of 15″. Now we need to measure the total distance of side A on the right triangle in the first diagram. The distance on my house ran 21′. To find out side C in the first diagram, I multiplied 21′ X 15″ and got 315″ or 26.25′. There are two other ways to figure out side C too. You can cross multiply by doing 21′ X 15″ divided by 12″. Or if you thought, “my roof rises 15″ in pitch for every foot. That is 3 extra inches per foot. So 3 times the length of side a”. That means 3″ X 21″=63″. Add that to 21′ (or 252″) and you get a total of 315″ or 26.25′. All in all the distance of side c is 26′! Now all I needed to measure was side X to know the full area of that section of the roof. To calculate the area of a rectangle, just you multiply length times width. The width of the roof (side c) was 26′. I got the measuring tape and on the ground I measured side X to be 29′. 26′ X 29’= 754 square feet! Okay, now it’s time to take a break, eat a brownie, pet the cat, and then we can think about how much rainfall is going to be hitting our roof, going into the gutter, and down the downspout. How Much Water Are We Talking? For Kentucky from what I’ve read, a typical storm we might get 1″ or 2″ of rainfall. But there are these things called 50 year floods, 100 year floods, and now even 500 year floods. We most often hear about the 100 year flood. Be sure to do some research, talk to an expert, be observant, on your area about rainfall. These ‘100 year floods’ is an estimate of how often an area will get a certain amount of rainfall once every hundred years. This of course doesn’t mean it can only happen one time in that span of years. We know how wacky weather is and that these ‘100’ year floods are happening more often. There are now even 500 year floods. In my area of Kentucky a 100 year flood may mean 10-12″ of rain within 24 hours. It could also mean 1″ of rainfall just in 20 minutes whereas a mild rainstorm we might get 1″ of rain over a period of a few hours. This quick pace of rainfall means flash flooding because the soils and storm sewer systems cannot handle that amount of water at one time. What does this all mean about our roof? The square footage of the section of roof I calculated is 754 square feet. There are 144 square inches in 1 square foot. So there are 108,576 square inches on my roof. If one inch of rain fell on this roof, that means 108,576 cubic inches of water has fallen. This calculates to about 63 cubic feet of water, or 405 gallons. This would be about the size of a 4’X3′ pool at 4′ deep. Just for 1″ of rainfall. The area of the roof I’ve calculated is only a quarter of the total roof surface area over my whole home. It is about 1400sq ft single story home. The guides I found online said to divide the surface are of your roof in feet by the depth of rain garden you plan to dig out. A garden at most can be dug out to 8″ deep. That means with my 754′ of roof area, and an 8″ deep rain garden, I would need a rain garden to cover 94′ of area. This would be an area about 8’X12′ for the optimal size. However, no matter how big a rain garden is, it is still going to help with water runoff. This is only the first step in planning for a rain garden. 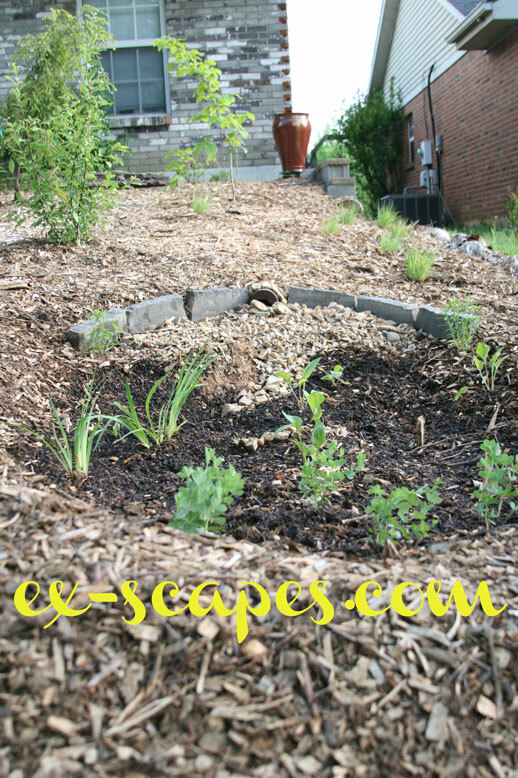 Watch for future posts about rain gardens on ex-scapes.com on topics such as drainage, design, and rain garden plants.